Looking back at my experience as a peace educator and advocate that spans more than three decades, I have seen how my work has borne good fruits because it embraces a philosophy that is rooted in upholding human dignity and the sacredness of humanity’s Earth home. It is a philosophy that has been inspired by my Faith, my education, and all the committed people and groups who have influenced me, including those who are from the Pax Christi movement. Peace educators often refer to peace education as transformative education, because it seeks to transform mindsets, values and actions which have sadly brought us to humanity’s difficult present moment, characterized by violent conflicts, prejudice and intolerance and propensity to use war and weapons as means of dealing with disputes. The same difficult historical evolution has affected the Philippines. Too many decades of neglect of the poor as well as historical injustices against the Moros have fueled the rise of non-state armed groups who have taken the path of armed struggle against the government. This is the context within which the peace education movement had blossomed in the country. We needed to find another way, an alternative to the way of violence toward seeking more justice and “right relationships” in the country. Because my initial kindred spirits and I were mainly teachers, we started with our schools. We asked: How could we make our schools embrace peace as its philosophy, and after having done so in a substantial way, share this experience with other academic institutions that may be yearning for the same aspirations? It did not take us very long to realize that a peaceable classroom was a good place to start but that having a peaceable school was even better, and that part of being a peaceable school is its engagement with other stakeholders in the country to advance social peace. Now we speak of a “whole school approach” where one important element is the engagement with other civil society actors and with the government agencies, too, so that the goal of moving closer to social peace can be achieved. And this is how we got involved and acted in solidarity with CSOs who are doing peace work in conflict-affected communities in Mindanao, among others. We initiated projects that sought the promotion of interfaith understanding and the training not only of educators but also of local government officials, and the security sector on “Women, Peace and Security” issues. A cornerstone of the latter is the participation of women in conflict prevention, conflict resolution and peace building and their protection against violence in times of armed conflict. However, there is so much more that needs to be done. The work has really just begun. My work has been enriched by my involvement in local and global peace networks and hopefully I have also enriched them in the process. 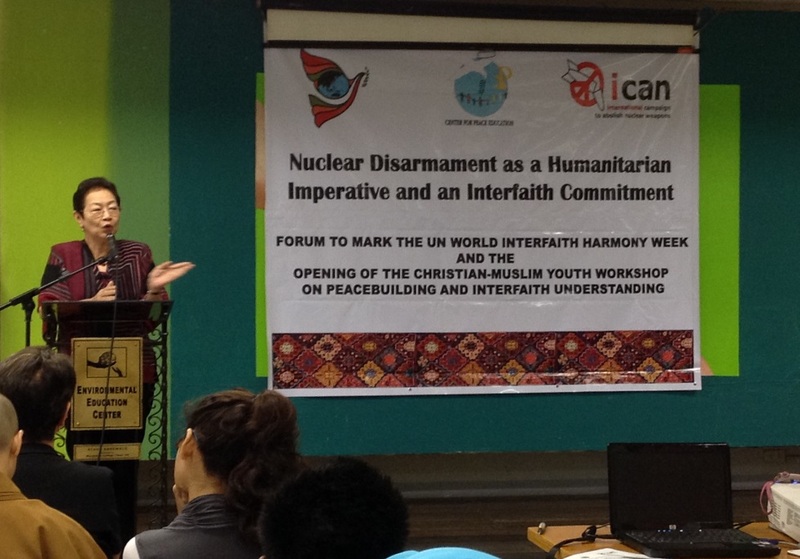 Among the local groups that I have been working with are the Peace Education Network, the Philippine Council for Peace and Global education, and Pax Christi Pilipinas, and among the international groups where I have been active are the Global Campaign for Peace Education, the Global Partnership for the Prevention of Armed Conflict, Pax Christi International and the International Campaign to Abolish Nuclear Weapons. I have found that acting in solidarity with many others who share the same philosophy and aspiration, locally and globally, with both civil society and government, have been productive of results.